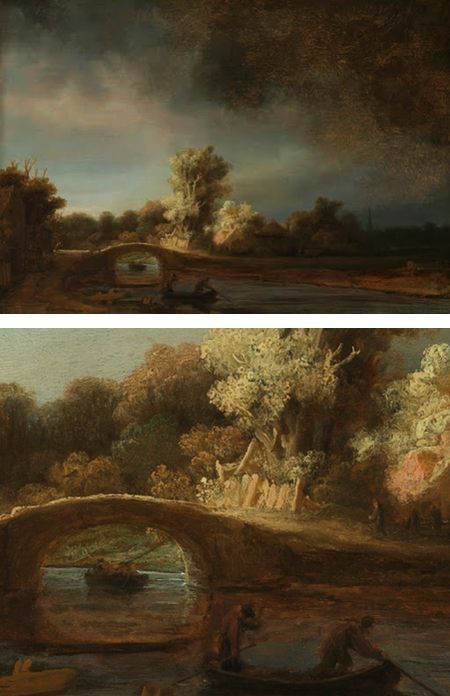 The Stone Bridge, Rembrandt, on Google Art Project. Mouse over to use zoom feature at lower right. Pascal Campion’s illustrations are, quite simply, a treat. Campion rarely uses line, working directly in areas of color, sometimes augmented with textures, but his images are so fundamentally graphic that his springy, energetic compositions carry much of the visual charm of drawings. At the same time they have the atmospheric qualities of painting. Like Tadahiro Uesugi, who works in similar applications of graphic color, Campion uses carefully chosen colors and a masterful touch for value to evoke mood, time and place with a finesse that would be the envy of many artists who work in a more elaborate manner. Campion uses of areas of distinct light and shadow, and in particular splashes and patches of bright light within subdued backgrounds, to lead your eye and highlight the focus of his images. He has a wonderful ability to use these effects, along with strong compositions and adept control of his color palette, to bring drama and energy to even the most unassuming of subjects; intimate domestic scenes and quiet moments of solitude become as visually compelling as raucous action. Campion is French-American. He studied at Arts Decoratifs de Strasbourg in France and now lives and works in San Francisco, where his clients include Dreamworks Animation, Disney TV, MTV, Nickleodeon, Cartoon Network and PBS. Though he also works in traditional media, Campion works primarily digitally. According to the About section on his website, he works in a somewhat unusual manner, sketching and coloring his illustrations in Adobe Flash. He then takes some of his images into Photoshop for final touches and lighting. There is an interview with Campion from the CharacterDesign blog in which he describes his daily routine and some of his working methods, and a very good video interview on Vimeo that includes brief time-compressed sequences of him working in Flash and Photoshop. In addition to the still images on his site, which are primarily personal rather than professional, there is a selection of short animations, some of which are essentially stick figures with more life and vitality than stick figures have any right to exhibit. He also has a blog on which he posts more recent work, and you can find a link at the bottom center of his home page by which you can subscribe to the “Pascal’s Sketch of the Day” malling list. Campion has posted a generous selection of his work on the site. The images can be viewed in the order they’re posted or by themes selected from a dropdown. Open your browser window to full screen to see them to best advantage. The images, in fact, are so numerous, the quality so consistent and the entertainment level so high that I will issue a Time Sink Warning, which is unusual for the site of an individual contemporary artist. Campion’s subjects are also delightfully light hearted, with storytelling aspects that frequently speak to the small pleasures in life, particularly of home and family. Like the best art, if you connect with his images they may accomplish the magic of allowing you to see the everyday world around you with fresh eyes. Like I said, a treat. Master Drawings London is a coordinated sale of master drawings by a number of galleries in London, UK, from 27 June to 5 July, 2012. This is apparently the 12th such sale, and the event has a dedicated website from which you can access an online catalog. Though it unfortunately takes the form of one of those cutesy page-flipping online magazines, you can zoom in on the images and, if you click the “Menu” button at upper left, you can download a PDF version. “Drawings” in this case means works on paper and includes watercolor and oil sketches. 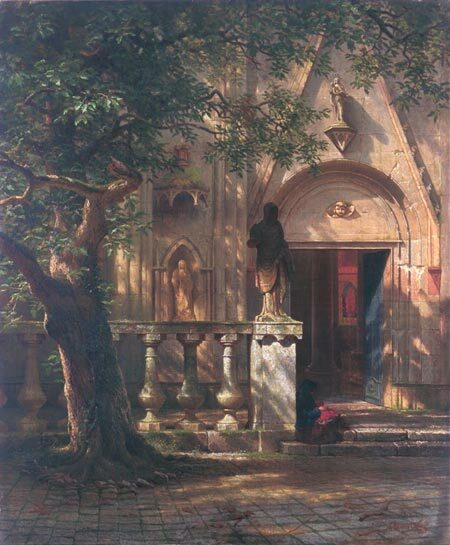 The Afternoon Meal (La Merienda), by Luis Egidio Meléndez. On Metropolitan Museum of Art. View Fullscreen and choose zoom or Download (lower right). I’m sorry to report that renowned illustrator Leo Dillon died on Saturday, May 26, 2012. Dillon, along with his wife and long-time artistic collaborator Diane, were particularly well known and influential in the fantasy and science fiction art communities. It would be difficult to sort out Leo Dillon’s work separate from that of Diane’s, nor would I attempt to, as theirs was a remarkably deep collaboration. The Dillons have never had a dedicated website or blog as far as I know. Into that void has stepped an unofficial blog dedicated to archiving The Art of Leo and Diane Dillon. For more, including links to additional resources, see my 2009 post on Leo and Diane Dillon.